The scientific study of consciousness is a young and thriving field, encompassing empirical and theoretical research of multiple disciplines. 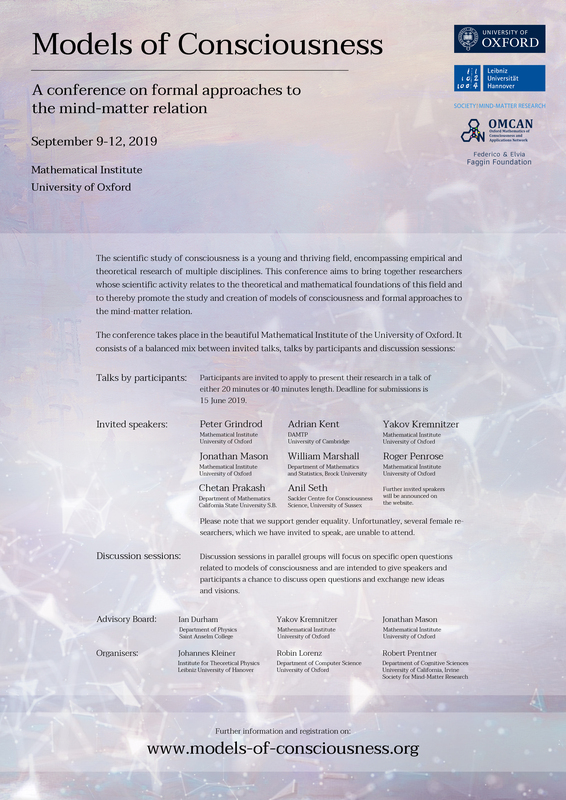 This conference aims to bring together researchers whose scientific activity relates to the theoretical and mathematical foundations of this field and to thereby promote the study and creation of models of consciousness and formal approaches to the mind-matter relation. Participants are invited to apply to present their research in a talk of either 20 minutes or 40 minutes length. See our application page. Deadline for submissions is 15 June 2019. Peter Grindrod is a member of Oxford's Mathematical Institute, he is a former non executive director of the Alan Turing Institute and a former president of the Institute of Mathematics and its Applications. In 2017, he published the seminal article 'On human consciousness: A mathematical perspective', further thoughts on which he will present in a talk entitled »What is it like to be a mathematician? Hypotheses and simulations«. Adrian Kent is professor of quantum physics at the DAMTP in Cambridge. His main areas of research are the foundations of quantum theory and relativistic quantum cryptography, where he has made numerous seminal contributions. Recently, he started exploring ideas on how conscious observers might deviate from quantum theoretical predictions and has put forward a pioneering model in his article 'Quanta and Qualia'. Title of the talk tba. Yakov Kremnitzer is a member of faculty at the Mathematical Institute in Oxford. He is the Principal Investigator of the Oxford Mathematics of Consciousness and Applications Network (OMCAN). In his research he explores mathematical approaches to understand the link between quantum collapse models and consciousness and has published on 'Integrated Information-Induced Quantum Collapse'. Title of the talk tba. Jonathan Mason is based at the Mathematical Institute, University of Oxford. 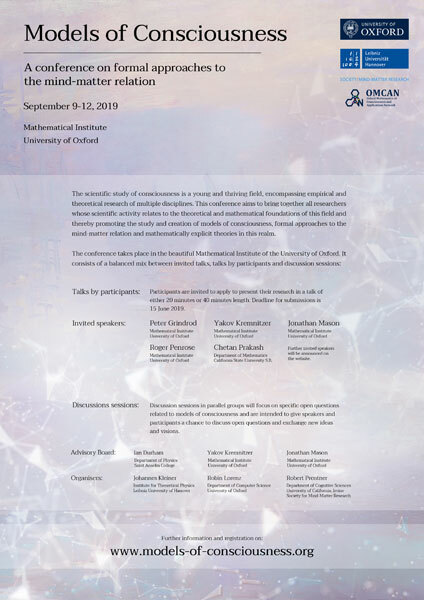 He is Network Champion for the Oxford Mathematics of Consciousness and Applications Network (OMCAN) and undertakes mathematical researches in to how the brain might be defining the relationship content of consciousness. He will present a talk titled »Expected Float Entropy Minimisation: A Relationship Content Theory of Consciousness«. William Marshall, assistant professor at the Department of Mathematics and Statistics of Brock University, is a collaborator of Giulio Tononi and has largely contributed to the development and exploration of the mathematics of Integrated Information Theory. His work includes the investigation of spatiotemporal scales of consciousness as modeled by IIT and the creation of the PyPhi framework. Title of his talk tba. Sir Roger Penrose (OM FRS) is Emeritus Rouse Ball Professor of Mathematics at the University of Oxford and Emeritus Fellow of Wadham College Oxford. Beyond major contributions as a mathematician and theoretical physicist to general relativity and cosmology he has, together with Stuart Hameroff developed the 'Orch OR' Model for Consciousness, written the celebrated books 'The Emperor's New Mind: Concerning Computers, Minds and The Laws of Physics' and 'Shadows of the Mind: A Search for the Missing Science of Consciousness' and founded 'The Penrose Institute', devoted to the study of consciousness, creativity, and the physics of the universe. Title of the talk tba. Chetan Prakash is an Emeritus Professor of Mathematics at California State University, San Bernardino. He is co-creator of 'conscious agent networks' and has developed the mathematical underpinnings of the interface theory of perception. He will present a talk titled »Structure Invention by Conscious Agents«. Anil Seth is professor of cognitive and computational neuroscience at the University of Sussex, where he is also co-director of the Sackler Centre for Consciousness Science. He has published extensively on the neuronal dynamics related to consciousness. Main themes of his work are interoception, predictive coding and measures of complexity and causality in neuronal systems. Title of his talk tba. ¹ Please note that we support gender equality. Unfortunatley, several female researchers, which we have invited to speak, are unable to attend. Discussion sessions in parallel groups will focus on specific open questions related to models of consciousness and are intended to give speakers and participants a chance to discuss open questions and exchange new ideas and visions. Note that participation in the conference requires registration. The conference is open to researchers of all disciplines who have an interest in formal approaches to the mind-matter relation. Deadline for applications to give a talk. If you would like to attend the conference, please register as described here. Details about the conference venue, accommodation and social events. Apply to present your research in a talk of either 20 or 40 minutes length.